Today and tomorrow have been all about meetings and building relationships with future clients. Challenge 1: I discovered two nights ago that using a generic cable (and not the Apple cable) is just not worth it as my iPad wouldn’t charge leaving me to make a quick dash to Big W to pick up a genuine Apple Lightning cable. Having said that, the battery powerpack has been re-charged twice to keep me going thru the day on the iPad (but it was a close call). Challenge 2: When surviving on using just your mobile device (iPad) in my case, make sure you have plenty of data. I went to a meeting in Manly this afternoon and was very embarrassed when I went to demonstrate a website and it wouldn’t load. When I bought my iPad last year I purchased 1 year worth of data (12GB) thru Telstra for $180. Normally, I don’t think I would have used it up, but with this blog challenge it has put extra strain on it. It is something that Internet providers are going to have to think about and act on. As we are on our mobile devices, so increases the demand, cost of using Internet and how much we are downloading. Essential when you are in cities like Melbourne of Sydney, where the weather can change (Melbourne has been very cold lately). This app sources its information from the Bureau of Meterology. As I have discovered, from before I left Melbourne, I downloaded the TransitTimes+ App so that I could access the travel times for the train from Sydney Domestic Terminal into Sydney Central Station and then out to a suburb in Inner-West Sydney. Today I have travelled from Inner-West into the city, walked and then caught a ferry from Circular Quay to Manly/Manly to Circular Quay and then back to the Inner West. Without this app, I would have not made a few of the connections. I also used the ‘Transport Info’ from NSW Transport to check times and plan a journey. 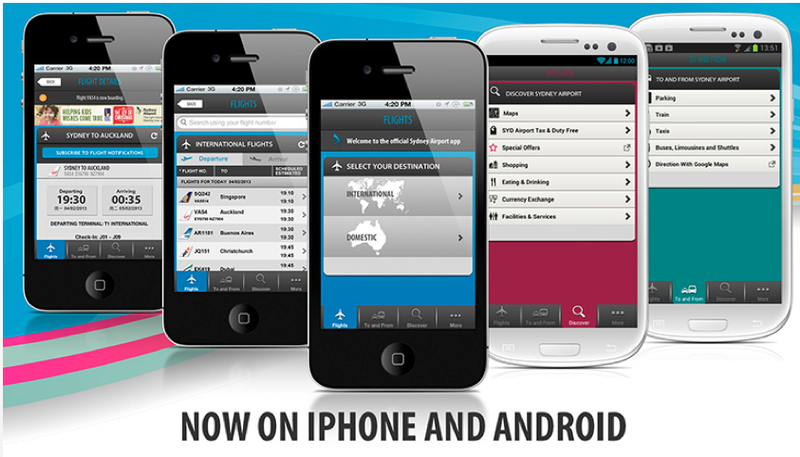 There is also TripView Sydney (lite and paid versions) to help with your timetable. Uber offers a service where you can use the app to ‘get picked up within minutes’, a very tempting offer! When in a different city (or even in your own) reliable transport is a must. Love Uber and what it can offer those is business. Here is the link to the app. This app offers features such as ‘track a taxi and find a taxi rank’, vital if you don’t know your way around (and if you are out at night time). It works for Sydney Metropolitan, check out the website for further information. 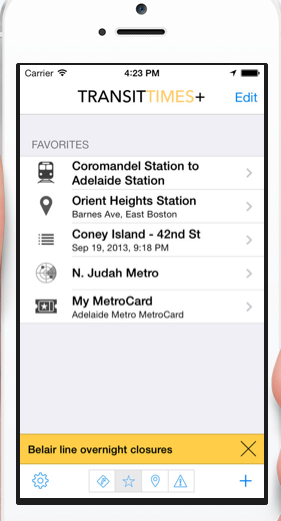 This app is perfect for those who commute between Sydney and Melbourne or even any of the other capital cities/regional areas. It has live flight status updates for departures and arrivals as well as being able to have notifications of those updates. The app also has the feature to book parking at the airport and find out which terminal you have to go to for your flights. There is nothing worse than when you get to a new city, you have no idea what to do in your spare time such as best places to eat, drink, and see the sights. 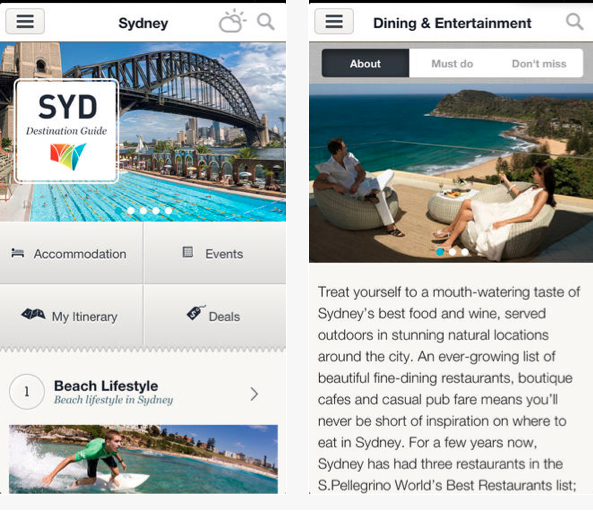 There is a Sydney Australia Official Guide (Android and iOS) as well as a magazine you can download from Apple’s Newsstand. Here is the link from ‘Moving Guide’ to find free wifi in Sydney (very handy when attending business meetings) or just working in between meetings with clients. The other option is to use an app such as Wi-Fi Finder. Tomorrow, I will be focusing on apps to get around Melbourne as I finish of my meetings in Sydney and head back to Melbourne. What an amazing day and here’s to an even better day tomorrow. Click here for yesterday’s blog post on ‘Entrepreneurs and Mobile Devices in Business’. Nice list. Thanks for including Sydney Moving Guide’s Free Wifi Spots page. As a Sydney-sider, I use TripView pretty much everyday. It’s probably the one app I use on a daily basis. Haven’t used mTaxi yet but will give it a go especially during the holiday season when getting a taxi in Sydney is close to impossible.